This article is about the year 1859. January 24 (O. S.) – Wallachia and Moldavia are united under Alexandru Ioan Cuza (Romania since 1866, final unification takes place on December 1, 1918; Transylvania and other regions are still missing at that time). January 28 – The city of Olympia is incorporated in the Washington Territory, in the United States of America. February 4 – German scholar Constantin von Tischendorf rediscovers the Codex Sinaiticus, a 4th-century uncial manuscript of the Greek Bible, in Saint Catherine's Monastery on the foot of Mount Sinai, in the Khedivate of Egypt. February 14 – Oregon is admitted as the 33rd U.S. state. February 17 – French naval forces under Charles Rigault de Genouilly capture the city and Citadel of Saigon in Vietnam, beginning the Siege of Saigon. February 27 – United States Congressman Daniel Sickles shoots Philip Barton Key (U.S. District Attorney), for having an affair with his wife. March 9 – The army of the Kingdom of Sardinia mobilizes against Austria, beginning the crisis which will lead to the Austro-Sardinian War. March 21 – The Commonwealth of Pennsylvania issues the charter establishing the Zoological Society of Philadelphia, the first organization of its kind in the United States, and founder of the nation's first zoo. March 26 – A French amateur astronomer, Edmond Modeste Lescarbault, claims to have noticed a planet closer to the Sun than Mercury (later named Vulcan). April 13 – The Cooper Union for the Advancement of Science and Art is founded by Peter Cooper, a New York industrialist, inventor and philanthropist. April 25 – Ground is broken for the Suez Canal, in Egypt. April 28 – The Pomona is wrecked off the English coast, with 424 dead. April 29 – Austrian troops begin to cross the Ticino River to Piedmont. April 30 – A Tale of Two Cities by Charles Dickens is published in England. May 4 – The Cornwall Railway opens across the Royal Albert Bridge, linking the counties of Devon and Cornwall in England. May 5 – Border Treaty between Brazil and Venezuela: The two countries agree their borders should be traced at the water divide, between the Amazon and the Orinoco basins. May 22 – Ferdinand II of the Two Sicilies is succeeded by his 23-year-old son, Francis II of the Two Sicilies. May 26 – Austro-Sardinian War – Battle of Varese: Giuseppe Garibaldi's Hunters of the Alps confront and defeat Austrian forces, led by Field Marshal-Lieutenant Carl Baron Urban. May 26 & June 2 – Geologist Joseph Prestwich and amateur archaeologist John Evans report (to the Royal Society and Society of Antiquaries of London, respectively) the results of their investigations of gravel-pits in the Somme valley and elsewhere, extending human history back to what will become known as the Paleolithic Era. May 30 – Battle of Palestro: The Sardinians defeat the Austrian army. May 31 – The Great Clock at the Palace of Westminster, London, is started. June 4 – Austro-Sardinian War – Battle of Magenta: The French and Sardinians defeat the Austrians. June 6 – The British Crown colony of Queensland in Australia is created, by devolving part of the territory of New South Wales (Queensland Day). June 8 – The discovery of the Comstock Lode in the western Utah Territory sets off the Rush to Washoe. June 15 – The so-called Pig War border dispute between the Americans and the British, over the San Juan Islands, begins by the death of the namesake pig. June 17 – The only recorded simoom ever in North America hits Goleta and Santa Barbara, California. June 18 – Aletschhorn, the second summit of the Bernese Alps, is first ascended. June 24 – Battle of Solferino: The Kingdom of Sardinia and the armies of Napoleon III of France defeat Franz Joseph I of Austria in northern Italy; the battle inspires Henri Dunant to found the Red Cross. June 30 – Charles Blondin crosses Niagara Falls on a tightrope, for the first time. Count Camillo Benso di Cavour resigns, as president of Piedmont-Sardinia. Pike's Peak Gold Rush begins in the Colorado Territory. July 1 – The first intercollegiate baseball game is played, between Amherst and Williams Colleges. Charles XV succeeds his father Oscar I of Sweden and Norway (as Charles IV). An armistice is declared, between Austria and France. July 11 – The chimes of Big Ben ring for the first time in London. July 11 – By the preliminary treaty signed at Villafranca, Italy, Lombardy is ceded to the French (who immediately cede it to Sardinia), while the Austrians keep Venetia, and the French promise to restore the Central Italian rulers expelled in the course of the war. This brings the Austro-Sardinian War effectively to a close. July 30 – Grand Combin, one of the highest summits in the Alps, is first ascended. August 16 – The Tuscan National Assembly formally deposes the House of Habsburg-Lorraine, ending an ascendancy of 109 years. August 27 – Edwin Drake drills the first oil well in the United States, near Titusville, Pennsylvania, starting the Pennsylvania oil rush. August 28–September 2– The solar storm of 1859, the largest geomagnetic solar storm on record, causes the Northern lights to be visible as far south as Cuba and knocks out telegraph communication (this is also called the Carrington event). September – British merchant Thomas Blake Glover begins business in Nagasaki, Japan. September 17 – In San Francisco, Joshua Norton proclaims himself to be His Imperial Majesty Emperor Norton I, Emperor of the United States and Protector of Mexico. October 16 – John Brown raids the Harpers Ferry Armory in Harper's Ferry, Virginia, in an unsuccessful bid to spark a general slave rebellion. October 18 – Troops under Colonel Robert E. Lee overpower John Brown, at the Federal arsenal. October 26 – The steamship Royal Charter is wrecked on the coast of Anglesey, Wales, with 454 dead. November 1 – The current Cape Lookout, North Carolina, lighthouse is lighted for the first time (its first-order Fresnel lens can be seen for 19 miles). November 10 – The Treaty of Zürich, reaffirming the terms of the Treaty of Villafranca, brings the Austro-Sardinian War to an official close. November 15 – The first Zappas Olympics open in Greece. 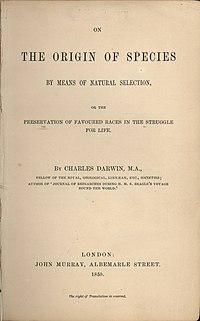 English naturalist Charles Darwin publishes On the Origin of Species, a book which argues for the gradual evolution of species through natural selection (it immediately sells out its initial print run). The French Navy's La Gloire, the first ocean-going ironclad warship in history, is launched. December 2 – Militant abolitionist leader John Brown is hanged for his October 16 raid on Harpers Ferry, West Virginia. December 4 – The Mekteb-i Mülkiye School is founded in the Ottoman Empire. Queensland separates from New South Wales. The Ateneo de Manila University is founded, as the Escuela Municipal de Manila. District nursing begins in Liverpool, England, when philanthropist William Rathbone employs Mary Robinson to nurse the sick poor in their own homes. The island of Timor is divided between Portugal and the Netherlands. The Rancho Rincon de Los Esteros Land Grant is confirmed to Rafael Alvisa (part of the present Santa Clara County, California). Bernhard Riemann formulates the Riemann hypothesis, one of the most important open problems of contemporary mathematics. Brisbane is declared the capital of newly separated colony Queensland, Australia. The University of Michigan Law School is founded. Karl Marx publishes A Contribution to the Critique of Political Economy. The Society for Promoting the Employment of Women is founded. The Mary Institute is founded in Missouri. Tidskrift för hemmet, the first women's magazine in the Nordic countries, begins publication in Sweden. ^ Prestwich, Joseph (January 1860). "On the Occurrence of Flint-implements, associated with the Remains of Animals of Extinct Species in Beds of a late Geological Period, in France at Amiens and Abbeville, and in England at Hoxne". Philosophical Transactions of the Royal Society. London. 150: 277–317. doi:10.1098/rstl.1860.0018. Archived from the original on February 26, 2012. Retrieved February 24, 2012. ^ Evans, John (January 1860). "On the Occurrence of Flint Implements in undisturbed Beds of Gravel, Sand, and Clay". Archaeologia. London. 38 (2): 280–307. doi:10.1017/s0261340900001454. Archived from the original on February 26, 2012. Retrieved 2012-02-24. 5. ^ Meynell, P-J. (1976). Methane: Planning a Digester. New York: Schocken Books. pp. 3. This page is based on the Wikipedia article 1859; it is used under the Creative Commons Attribution-ShareAlike 3.0 Unported License (CC-BY-SA). You may redistribute it, verbatim or modified, providing that you comply with the terms of the CC-BY-SA.